In a country where winter is intense and people love spending time outside, building an outdoor fireplace is essential. It’s frustrating when you can’t use your outdoor living space or al fresco for weeks or months because it’s freezing. With a fireplace or fire pit, you have a source of heat to combat the cold weather, allowing you to enjoy your outdoor space. 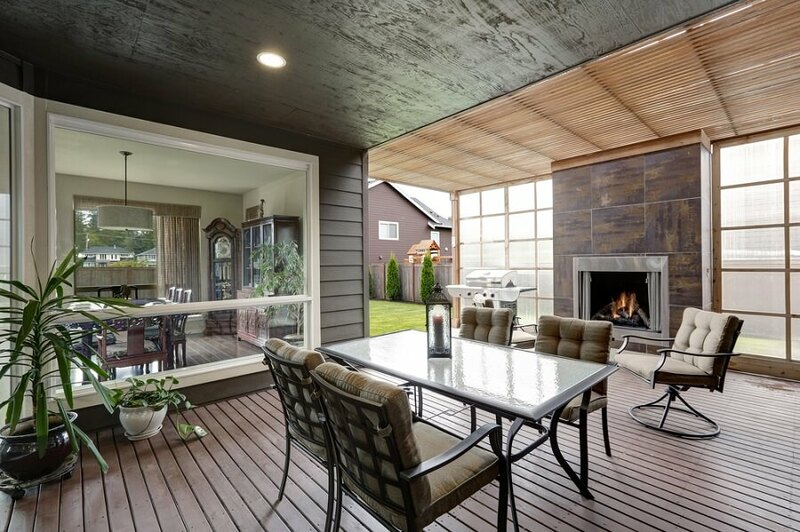 This deck is ready to entertain people even in the chilliest of days! Warm and cosy wooden elements and soft cushions surround the outdoor fireplace. We like the use of patterned tiles for the fireplace’s mantle. The tile’s design wraps up the combination of Earthy elements in the room. The Japanese-inspired deck cover is also an interesting touch to this space. It filters the amount of natural light that comes in the space. Surrounded by lush greenery, this concrete patio doesn’t need much decoration. The huge stone-tiled fireplace steals most of the attention the moment you step in this area. We admire the colour coordination between the floor, furniture, and the fireplace because it doesn’t compete with the surroundings. 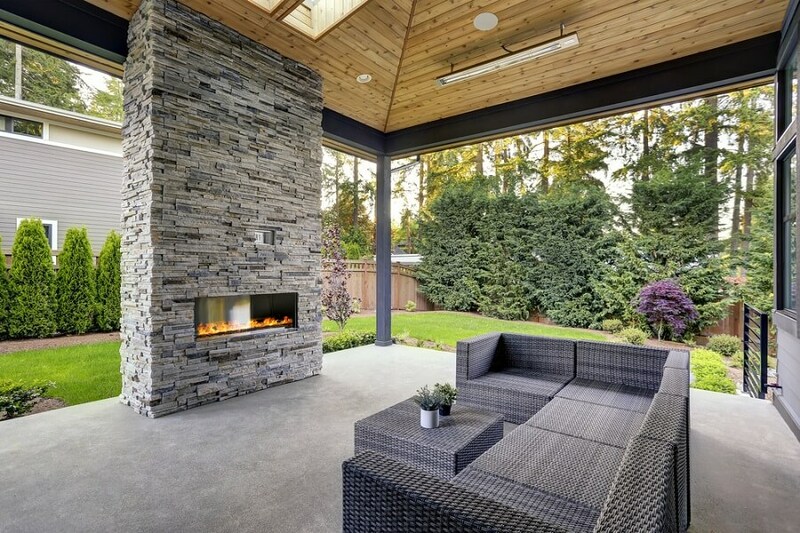 As you can see, the mantle design of this outdoor fireplace is similar to the previous one. 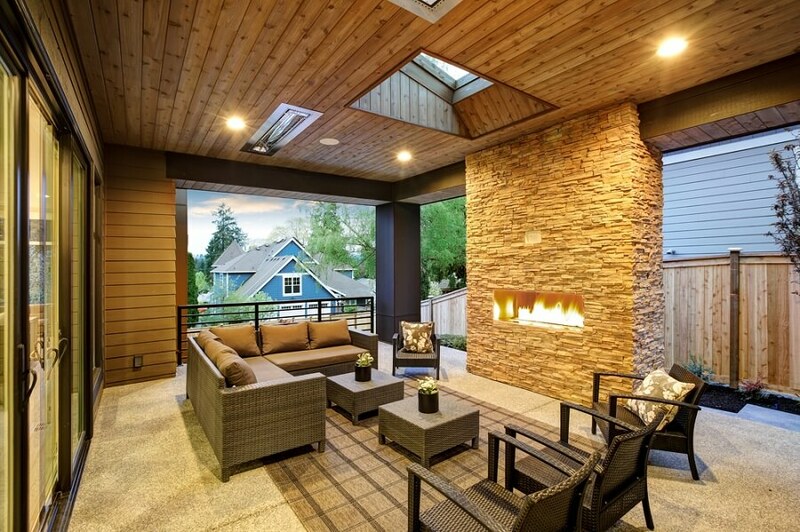 But in this scenario, the lighting lets you experience a homier outdoor living room. We like the idea of having a skylight above the fireplace to highlight it more. To make it pleasing to the eyes, use the same set or kind of furniture pieces. This spot is where you can enjoy the comfort of a wicker couch, chair, and ottomans. Even the rug adheres to the pattern of the weaved furniture. 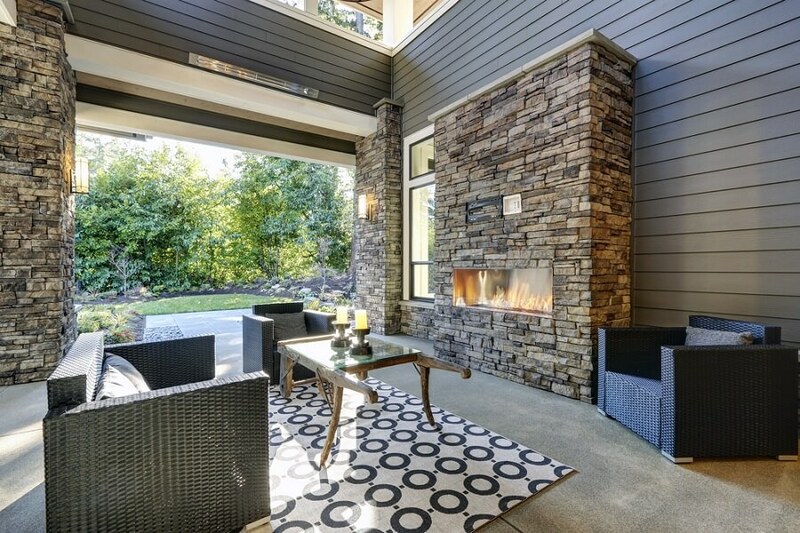 This home’s covered patio boasts its stone fireplace. We liked the idea of pairing the traditional appeal of stones with modern elements such as the wicker patio chairs, the gorgeous rustic wood coffee table, and the white and black geometric rug. 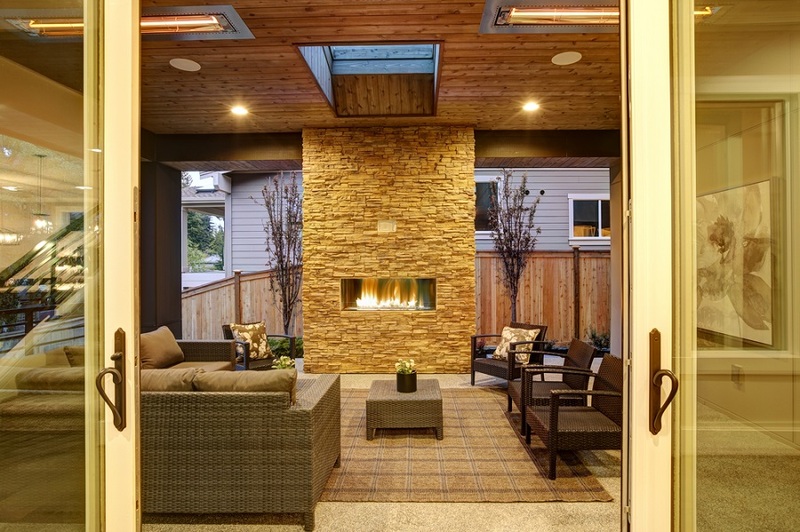 Behind a new luxury home is a covered patio furnished with a television, outdoor fireplace, and a couch. The L-shaped couch perfectly creates a corner view where you can enjoy the warmth of the fire, calmness of the garden, and entertainment of the TV. The area around a fireplace is a great spot for small talks or for some alone time. 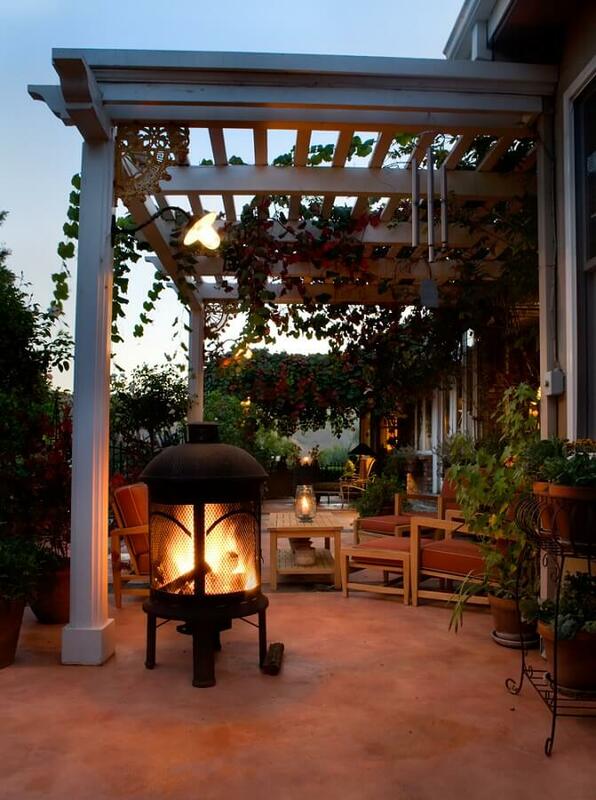 Give yourself that private outdoor area by setting up a few chairs near the hearth. 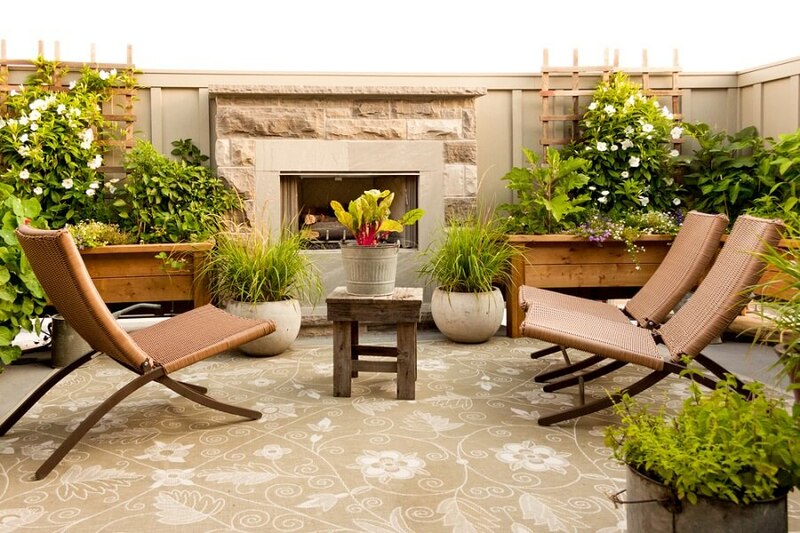 We love this mini garden that surrounds entire area, as well as the folding rattan chairs atop a floral rug. 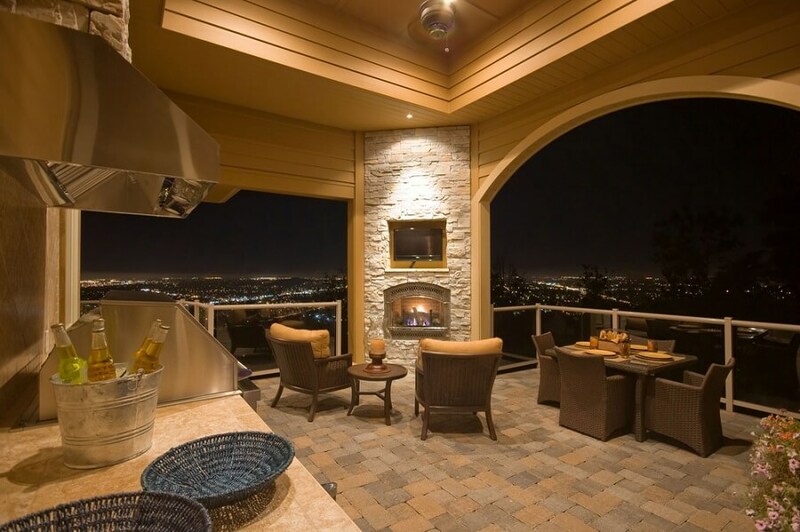 You can have a fireplace to warm up your terrace or balcony too. We recommend this design especially when your home is situated on high grounds (hills, mountainside, or a cliff) and you have a spectacular view. Depending on the size of the space, you can use this stunning area for an outdoor kitchen, dining, and a tiny sitting area. We like the idea of the fireplace as a free-standing element. It is different from the attached design that we’re all used to see. Plus, you decide how near your can sit around the fire. Gazebos are great for get-togethers outside the house. 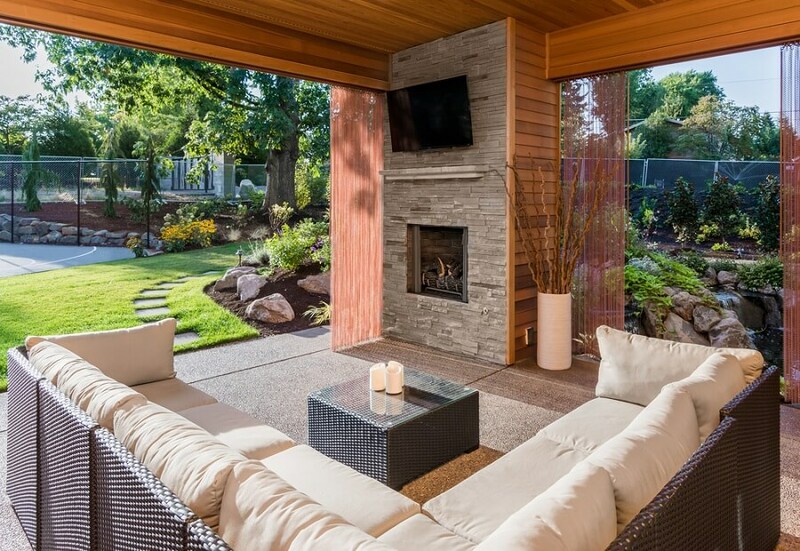 Warm it up with a permanent outdoor fireplace. It’ll be a great spot for reading a book while drinking a cup of hot cocoa in winter. Our architects can help you design an outdoor living or alfresco area. Leave a message and we’ll get back to you soon!